The Ethan Kitchen Counter Stool is a fixed-height stool with a PU leather foam seat and solid beech wood legs. The simple and classic design of this bar stool makes it perfect for a versatile and relaxed look. The foam seat is covered in premium PU leather, providing both comfort and durability. Its frame and legs are made of reinforced beech wood. The gently curved seat and wide-set sturdy legs provide an inviting and homey look. One stool was missing a piece when it arrived, but the after sales service team were prompt to negotiate an amenable outcome. 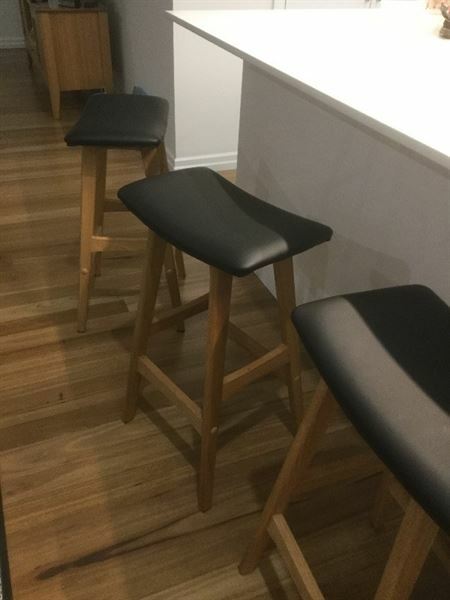 I am now very happywith the stools. We really appreciate that wonderful review Mark! Your satisfaction is important to us. Thank you for your patience and understanding on this matter and for giving us the opportunity to make it right for you. Hi Isabel, thank you for taking the time to write a great review. They look gorgeous in your kitchen! Overall I am very happy with the bar stools. I was very impressed by the way the product was packaged, with each piece individually wrapped to protect it from damage during transit. The stools were also easy to assemble. However, I was disappointed with the length of time it took to deliver this product. I placed my order on 25 February and did not receive it in Perth until 21 March. Thank you Moira for sharing your experience regarding the delivery of your order. Rest assured, this will be escalated to or courier so that they can adopt measures to prevent issues of this nature from happening again. We are equally pleased to hear that you are satisfied with the quality of the stools. Excellent in every way - good price, fast delivery, well packaged, easy to put together. Thank you so much for such great review, Catherine! We are glad that you are satisfied with the quality of the stools and your overall experience with us! I have had my stools for about a month now, they look excellent and fit nicely under kitchen bench. Very comfortable. Purchase was easy and received goods in quick time and in good order. It is always our goal to make our customers happy and we are equally pleased to hear that we were able to provide great service that you deserve. Thanks for sharing, Maureen!